Following the success of the first edition of the Algerian Paper of the Year Awards, which took place in 2013, anasr.org organized the second edition in 2014. The purpose of the Awards is to recognise and celebrate the achievements of Algerian scientists through a process of nomination, shortlisting and peer review that fully engage the wider community of Algerian scientists and researchers in and out of the country. The 2014 Awards was run by an awards committee that took charge of the administrative aspects of the Awards. The lengthy and multistage process that starts by nominating the papers for the Awards all the way to identifying the winning papers was kept the same as those adapted for the first edition in 2013. What was new in the 2014 Awards? Due to the high quality of the papers nominated for the awards, the awards committee decided that as well as announcing the details of the winning papers, the details of the other top 4 papers across each discipline, which undergo the peer evaluation process, will also be published as “Honorable Mentions”. The aim of this is to acknowledge the efforts and hard work of the authors of the excellent papers that made it to the final stages of the awards. Indeed, across the 5 disciplines for which the awards were given, there was stiff competition between the top 5 papers that were shortlisted for the peer evaluation process and thus it was a sensible option to acknowledge the excellent standards of all the shortlisted papers. Another novelty of the 2014 edition of the awards was the announcement of the winning papers which made in a event that was held in London. The purpose of this event was to further involve the community in the announcement of the winners. Additionally, organizing such an open meeting to announce the winners of the awards emphasizes the openness of this initiative to the Algerian community abroad and gives the chance to numerous Algerian scientists to present their work. More importantly, the meeting was live-streamed and this gave a great opportunity to Algerians outside the UK, especially those in Algeria, to follow the event. This also provided a unique opportunity to speak to the winners of the awards live and provided them with a platform to promote themselves and their research. In terms of numbers, the 2014 edition of the Awards was very successful as it attracted a total of 253 nominations, which is a about 34% increase from last year’s edition (see slideshow for more numbers). Impressively, the papers originated from 32 different Algerian universities with the University of Tlemcen contributing the largest number of paper; 26 papers out of the 253 papers nominated for the Awards. Across the 5 disciplines, there was a significant increase in the papers nominated for each discipline with Biological Sciences being the exception where the number of papers remained the same compared to the 2013 edition. The laureates were awarded a commemoration plaque bearing the name of the authors, the paper’s title and the year of the award. Additionally, each author on the paper received an award certificate. The winners from each discipline were also be given the excellent opportunity to be featured in an exclusive interview on Inspire Magazine, anasr.org’s official magazine and the first Algerian magazine dedicated to scientific outreach in English. More importantly, besides the symbolic prizes, The Algerian Paper of the Year Awards offer an opportunity to promote the work of Algerian researchers that have been produced at Algerian universities and research institutes. Whether they are a runner up or the ultimate winner, papers were judged by high caliber experts in corresponding fields of research from renowned universities and so have benefited from a constructive reviewing process and the acknowledgement of the wider international scientific community. Interviews with the winners will further promote the work of the awards laureates to national and international readership, therefore increasing the recognition and visibility of their work, its impact, and hopefully open up avenues for potential collaborations with peers from around the world. Authors: Mohamed Lamine Toumi, Sameha Merzoug, Bruno Baudin, Abdelkrim Tahraoui. Title: Quercetin alleviates predator stress-induced anxiety-like and brain oxidative signs in pregnant rats and immune count disturbance in their offspring. Affiliations: Laboratoire de Neuro-endocrinologie Appliquée, Département de Biologie, Université Badji Mokhtar, BP 12, 23000, Annaba, Algeria. Département de Biologie, Institut des sciences de la nature et de la vie, Faculté des Sciences, Université d’El-Tarf, BP 73, 36000, El-Tarf, Algeria. Service de Biochimie A, Hôpital Saint-Antoine, 184 rue de Faubourg Saint-Antoine, Paris 75571 Cedex 12, France. What the reviewers said: “The research is well-designed and executed and the paper is well-written. […] This research demonstrates the importance of polyphenol rich-nutrition in protecting stress-mediated damage in late pregnancy and could potentially be translated to humans.” “This paper stands out from all the papers nominated for the 2014 APYAs as it is using techniques and experiments that other papers nominated for the Biological Sciences discipline lack. The importance of the question posed and addressed in what makes this paper exciting”. Interview with the winners can be accessed here. Meriem Abdi, Faouzia Zemani-Fodil, Mostefa Fodil, Meriem Samia Aberkane, Hadj Touhami, Nadhira Saidi-Mehtar, Catherine Costa, and Abdallah Boudjema. First Molecular Analysis of F8 Gene in Algeria: Identification of a Novel Mutation. Clinical and Applied Thrombosis/Hemostasis, 2014, 20, 741-748. Bakhouche Houcher, Ayşenur Öztürk, Samia Begag, Zahira Houcher and Nejat Akar. Identification of four common α-thalassemia gene deletions among a group with hemoglobinopathies in Sétif population, Algeria. Pteridines, 2013, 24, 251–255. Azzedine Ferchab, Anna Laura Capriottia, Giuseppe Carusoa, Chiara Cavalierea, Hocine Gherrouchac, Roberto Samperia, Serena Stampachiacchierea, Aldo Laganaa. Gel-free proteomics reveal potential biomarkers of priming-induced salt tolerance in durum wheat. Journal of Proteomics, 2013, 91, 486–499. Rafik Menada, Souaâd Smaïa, Elara Moudilouc, Farida Khammarb, Jean-Marie Exbrayatc, Thérèse Gernigon-Spychalowicza. Immunolocalization of estrogen and androgen receptors in the caput epididymidis of the fat sand rat (Psammomys obesus): Effects of seasonal variations, castration and efferent duct ligation. Acta Histochemistry, 2014, 116, 559-569. What the reviewers said: “A fascinating paper concerned with novel calixarene sulfonic acids. The structure diagrams are well done as are the reaction schemes and the experimental procedures. The biological data is also well presented. I look forward to hearing more about this new calixarenes, in particular their pharmaceutical use”. Mebarek Bahnous, Abdelmalek Bouraiou, Meryem Chelghoum, Sofiane Bouacida, Thierry Roisnel, Farida Smati, Chafia Bentchouala, Philippe C. Gros, Ali Belfaitah. Synthesis, crystal structure and antibacterial activity of new highly functionalized ionic compounds based on the imidazole nucleus. Bioorganic Medical Chemistry Letters, 2013, 23, 1274-1278. Sana Zama, Abdelmalek Bouraiou, Sofiane Bouacida, Thierry Roisnel, Ali Belfaitah. Reaction of carbon disulfide with 2-bromoimidazolium salts. Novel bicyclic mesoionic thiazolo[3,2-a]imidazoles. Tetrahedron Letters, 2013, 54, 5605–5607. Saida Benzerka,Abdelmalek Bouraiou, Sofiane Bouacida, Thierry Roisnel, Chafia Bentchouala, Farida Smati, Bertrand Carboni and Ali Belfaitah. Synthesis of New 3-heteroaryl-2-phenylquinolines and their Pharmacological Activity as Antimicrobial Agents. Letters in Organic Chemistry, 2013, 10, 94-99. Mohamed El Amine Dib, Hocine Allali, Amel Bendiabdellah, Nawel Meliani, Boufeldja Tabti. Antimicrobial activity and phytochemical screening of Arbutus unedo. Journal of Saudi Chemical Society, 2013, 17, 381–385. Authors: Meriem Boumehed, Belal Alshaqaqi, Abdelaziz Ouamri, Mokhtar Keche. Title: Design Moving Objects Localization by Local Regions Based Level Set: Application on Urban Traffic. Affiliations: Signals and Images Laboratory, Department of Electronics, Faculty of Electrical Engineering, University of Science and Technology ORAN– Mohamed Boudiaf– USTO-MB. What the reviewers said: “The proposed method [described in the winning paper] is very interesting and the experimental results compared with other state-of-the-arts techniques are convincing.” “This novelty [of the method described in the winning paper] is introduced in a consistent Level Set formulation and tested extensively with very challenging sequences. Moreover the paper is well written and easy to follow”. Nabil Taib, Brahim Metidji, Toufik Rekioua. Performance and efficiency control enhancement of wind power generation system based on DFIG using three-level sparse matrix converter. International Journal of Electrical Power & Energy Systems, 2013, 53, 287–296. Brahim Metidji, Member, Nabil Taib, Lotfi Baghli, Senior Member, Toufik Rekioua, and Seddik Bacha. Phase Current Reconstruction Using a Single Current Sensor of Three-Phase AC Motors Fed by SVM-Controlled Direct Matrix Converters. Industrial Electronics, IEEE Transactions, 2013, 60, 5497– 5505. Serir, A. Beghdadi, F. Kerouh. No-reference blur image quality measure based on multiplicative multiresolution decomposition. Journal of Visual Communication and Image Representation, 2013, 24, 911–925. Bouras, F. Bourourou, A. Djellad. Reliabilty of The DTC-SVM in losses minimisation of Wind Conversion Chain output inverter. Power Engineering, Energy and Electrical Drives (POWERENG), 2013, 4th International Conference on Power Engineering, Energy and Electrical Drives, Istanbul, Turkey, 13-17 May 2013. Ouessai Asmaa, Keche Mokhtar, Ouamri Abdelaziz. Road traffic density estimation using microscopic and macroscopic parameters. Image and Vision Computing, 2013, 31, 887–894. Author: Djamel Tahtat, Mohamed Mahlous, Samah Benamer, Assia Nacer Khodja, Habiba Oussedik-Oumehdi, Fatima Laraba-Djebari. Title: Oral delivery of insulin from alginate/chitosan crosslinked by glutaraldehyde. Affiliations: Department of Irradiation Technology, Nuclear Research Center of Algiers. USTHB, Faculty of Biological Sciences, Laboratory of Cellular and Molecular Biology, Bab Ezzouar, Algiers, Algeria. Zineb Djeraba, Karim Boumedine, Amina Arroul-Lammali, Fifi Otmani, Houda Belguendouz, and Chafia Touil-Boukoffa. Ex vivo immunomodulatory effect of all-trans-retinoic acid during Behçet’s disease: a study in Algerian patients. Immunopharmacology and Immunotoxicology, 2014, 36, 78-86. Mohamed Brahimi, Mohamed Nazim Bennaoum, Hassiba Lazreg, Affaf Adda, Hadjer Beliali, Amel Mihoubi, Abdessamad Arabi, Mohamed Amine Bekadja. A simple and accessible screening method for congenital thrombopathies using an impedance haematology counter. Journal of Medical Hypotheses and Ideas, 2013, 7, 11–14. Assia Nacer Khodja, Mohamed Mahlous, Djamel Tahtat, Samah Benamer, Souad Larbi Youcef, Henni Chader, Latifa Mouhoub, Manel Sedgelmaci, Nassima Ammi, Mohamed Benslimane Mansouri, Saadia Mameri. Evaluation of healing activity of PVA/chitosan hydrogels on deep second degree burn: Pharmacological and toxicological tests. Burns, 2013, 39, 98-104. Ouahiba Khaib, Dit Naib, Mourad Aribi, Aicha Idder, Amel Chiali, Hakim Sairi, Isabelle Touitou, GérardLefranc and MounaBarat-Houari. Association analysis of IL10, TNF-α, and IL23R-IL12RB2 SNPs with Behçet’s disease risk in Western Algeria. Frontiers in Immunology, 2013, 4, 342. Authors: Y. Bouznit, Y. Beggah, A. Boukerika, A. Lahreche, F. Ynineb. Title: New co-spray way to synthesize high quality ZnS films. Affiliations: Laboratory of Materials Study, Jijel University, Jijel. Laser Department, Nuclear Research Centre of Algeria, Algiers. Science & Technology Department, University of Bejaia, Bejaia. Laboratory of Thin Films and Interface, University Mentouri, Constantine. What the reviewers said: “The authors have done a nice study regarding the structure of the films obtained and their optical properties including band gap calculations. I congratulate the authors for the quality of their results”. Mourad Chikhi, Boudjemaa Agoudjil, Abderrahim Boudenne, Abdelkader Gherabli. Experimental investigation of new biocomposite with low cost for thermal insulation. Energy and Buildings, 2013, 66, 267–273. Taqiy eddine Boukelia, Mohamed-Salah Mecibah. Parabolic trough solar thermal power plant: Potential, and projects development in Algeria. Renewable and Sustainable Energy Reviews, 2013, 21, 288–297. Gama, C. Larbes, A. Malek, F. Yettou,and B. Adouane. Design and realization of a novel sun tracking system with absorber displacement for parabolic trough collectors. Journal of Renewable Sustainable Energy, 2013, 5, 033108. Omar Behar, Abdallah Khellaf, Kamal Mohammedi. A review of studies on central receiver solar thermal power plants. Renewable and Sustainable Energy Reviews, 2013, 23,12–39. Bahloul, B. Nessark, E. Briot, H. Groult, A. Mauger, K. Zaghib, C.M. Julien. Polypyrrole-covered MnO2 as electrode material for supercapacitor. Journal of Power Sources, 2013, 240, 267–272. anasr.org is an independent initiative, developed and maintained on a voluntary basis without external funding by a dedicated and growing team of Algerian scientists and professionals. As a community led initiative, we at anasr.org strive to seek funding only from the community that we aim to serve, in line with our core mission and principles. As was the case with the previous edition, we thus turned to the community to raise the funds needed to sponsor the 2014 Algerian Paper of the Year Awards. The crowd-fundraising process was vastly successful and the community came together beautifully and generously to help us cover the majority of the costs, which included producing the award plaques and certificates, their shipment to Algeria as well as the costs of the winners announcement event. 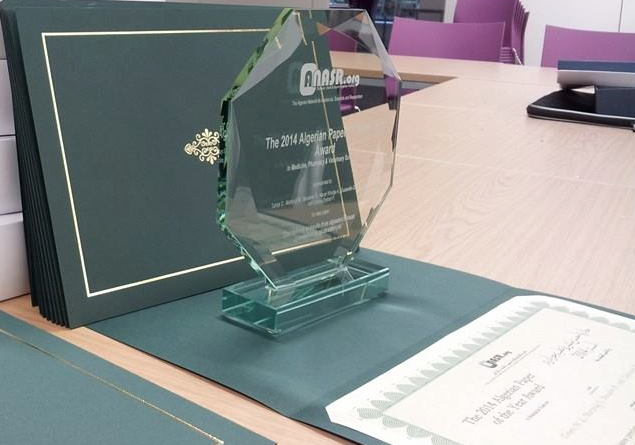 anasr.org team and awards committee would like to thank everyone who joined us in celebrating the winners of the 2014 Algerian Paper of the Year Awards, both at the event in London and those who joined us on the live stream. Thank you again to everyone who nominated their papers for this year edition of the awards, to the shortlisting panels and to the experts across the globe who helped review the papers, to our colleagues here in the UK who delivered very interesting talks as well as to everyone who donated so generously, for helping make this event a success. Anasr.org will continue with the journey to discover the best of Algerian scientific work and will be running a 3rd edition of the Awards, which will be launched on the 1st January 2015. Further details will be available on this page.